How much does DiscoverText cost ? The pricing for DiscoverText starts at $99.0 per month. DiscoverText has 2 different plans such as - Professional at $99.0 per month and Enterprise at $2000.0 per month. Cons: I have few things I dislike about DiscoverText. Ability to pull data from Instagram would be great, given consumers' interest in the platform. Overall: I began using DiscoverText as a doctoral student in 2013 while conducting research on sport fans' social media usage. Six years later, I still find myself turning to DiscoverText whenever I need to collect social media data. As someone who is not very technology savvy, I find the platform to be quite user-friendly, and the ability to code data right within the platform is extremely beneficial. Beyond the benefits of the tool itself, my interactions with the DiscoverText team are always pleasant and informative. It can be so difficult these days to feel "heard" as a customer, but I don't have to worry about that with DiscoverText. Whenever I have questions or issues, they are quickly answered/remedied by the DiscoverText team. Pros: The ability to collect historic Twitter data and the functionality that enabled the cleaning, filtering, sorting, and analyzing of data. Cons: The meta data graphs did not have controls to adjust the scale in order for two different graphs generated at different times to align. Overall: Great customer service and assistance in using the product. Pros: The advanced filtration tool allows you to sort of metadata tags like the geolocation of a tweet, which is extremely useful for academic work. This software is a great platform for an engineering academic like me to ease into the fields of text analytics and sentiment analysis. Cons: Like any software there is a learning curve for Discover text. 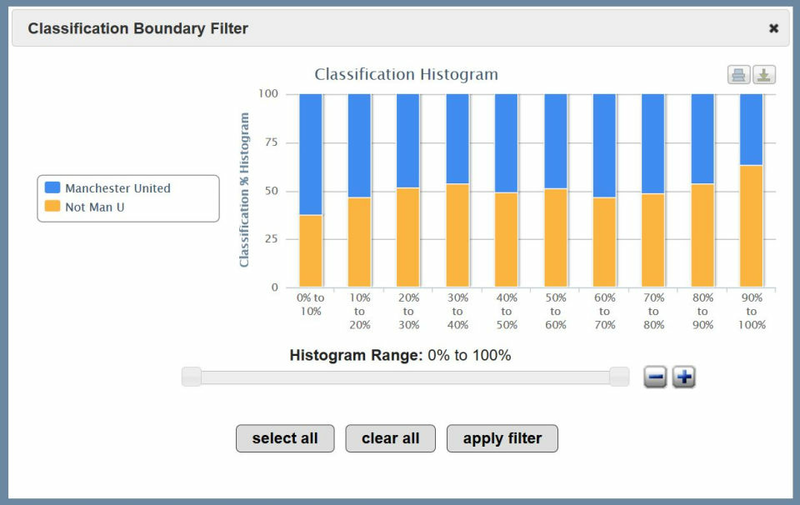 Rely on the vast tutorial library to get through tasks., and sometimes the distinctions between data levels (buckets vs datasets) can be confusing. Overall: Discover text has been an incredible resource to explore crisis communication. The founder is particularly dedicated to his product and has held numerous one on one tutorial sessions for me. That is a very generous review. You are right that as a founder, the software acquires the status of a family member; almost a beloved child. ARCHIVES: Raw text and metadata (static or live feeds updating) that can be manipulated without changing the raw data archive. BUCKETS: Sub-sets of raw data (search, filter, code, cluster, classify and then mix and match techniques to make buckets). DATASETS: Samples for human coding and machine learning. One advantage to this structure is continual LOW-RISK experimentation. Try one pathway, if it works, keep going, if not, try an alternate route informed by previous failures. People often ask: what comes first? Once the data is loaded, that is up to you. There is no A,B, C path the same for all. The platform supports qual, quant, and mixed methods. Cons: Probably the old fashioned user interface, but friendly!!! You are right, the interface is old. We are trying to tidy it up a bit these days and find better options to get the functionality exposed. Sometimes we hide the best tools too well. We are very grateful for the review! Pros: My review of DiscoverText is a bit limited because I'm really only using it for Twitter. That said, the features are incredible. I know a bit about coding, but the prospect of learning JSON to use Twitter's API was doable but daunting. When I came across DiscoverText I was so pleased to find a way to search, use, and categorize Twitter data that made sense and would save me A LOT of time. I didn't anticipate getting access to so much useful metadata that was easy to navigate and use, so I was pleasantly surprised. The built-in bucket and dataset features are great ways to organize the massive amount of Twitter data that can be collected. 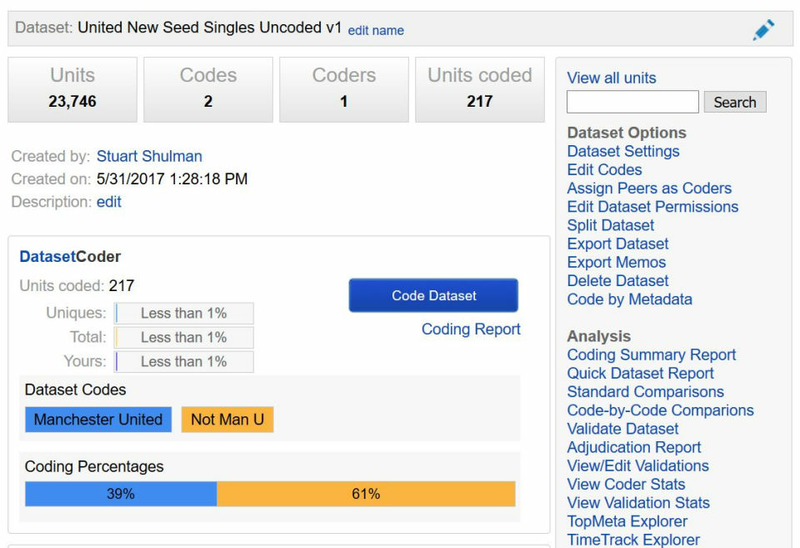 The ability to code the data with peers within DiscoverText is also super useful. I really can't exaggerate how many features DiscoverText has that I didn't think I would need but have used to improve the quality of my scholarship. Cons: The software has many features that I didn't find on my own, so the UI could be improved a bit. That said, the one-on-one tutorial that the founder provides helps mitigate this issue. The tutorial videos are helpful too! You'll just have to be prepared to set aside a few hours to really learn the program. Overall: I'm a PhD candidate who straddles the Humanities and Social Sciences, so I use DiscoverText as a research tool. It is really hard to express how inspirational a review like this is. You have really made our day. We are looking at 2019 trying to decide if this is the year to build v2 of a 9 year old interface. Thanks for embracing buckets & datasets; this was a tough sell to some folks over the years, but they are critical to User success. We are very grateful you took the time to write this generous review. Please write us if we can do anything for you. Pros: I am quite satisfied the fact that I eventually found the right app in analysing textual data in twitter!! Overall: I was sad after knowing that Twitter actually wants money from the company in retrieving data that should not be charged I think..
Pros: It was easy to set up and had all the right features for me. Cons: It had too much for me so I got a bit overhwelmed. Pros: I like the program especially which provides qualitative data easily. I used the program to analyze specific terms data in the Twitter and satisfied with the program. Cons: The program allows analyzing certain dates in Twitter such as 2016-2017. I think that it must be expanded for date. Pros: DiscoverText worked exactly as hoped, but the most impressive thing is how helpful and personal the DiscoverText team was with helping me with the particular request that I had. Cons: Figuring out how to download the raw data took a little bit of time. I can't blame DiscoverText for wanting me to stick with their interface and their tools, but it was still a little annoying that it took a while to get to what I needed. Overall: I used DiscoverText after hearing about them on the Association of Internet Researchers mailing list. 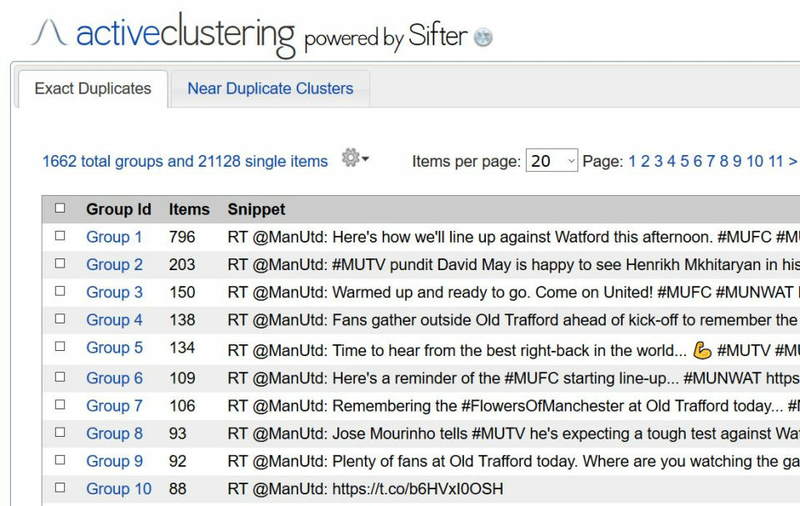 Stu and his team helped me put together a Twitter dataset that I'd been trying to put together through other methods-never without any success. This is a huge step forward for some of the research that I'm trying to do; I'm already getting some interest in the data and my analysis of it, and I couldn't have done it without DiscoverText! Thank-you for taking the time to write a detailed review. It really helps us out. b) a daily export limit of 50,000 items. We did not make the rule; we simply obeyed it. 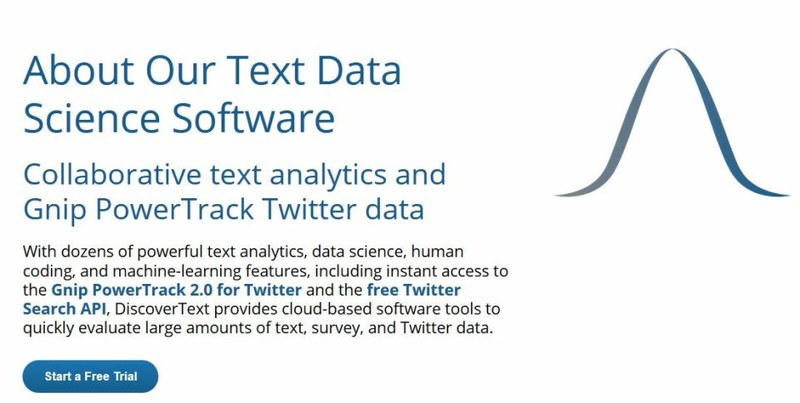 For the record, our platform's live connection to the Twitter display, and our ability to suppress deleted Tweets, are two of the many reasons why you are better off keeping data in DiscoverText. For inter-operability with Gephi or NodeXL, we still have the graphml export option. At the very least, using our tools to create clean, legal, focused, exports is an option. Pros: How easy it is to use it. It did not take long for me to get the hang of the most basic features the software offers. Cons: There are some features that were harder to use than others, but customer service was a great help in setting up and/or explaining these issues. Overall: Overall, it was a great software for my research. So far, I have produced two different studies that were based on DiscoverText Twitter data analysis, one of which is already published. So, Thank you!